Hello, my friend. I see you. I see you over there - pushing through. I see you smiling when it hurts so horribly. I see you laughing when someone makes you feel good. I see you putting on a strong face when you believe you need to. You do amazing things every day. As simple as these things may sound to me, to many? I see you when you want to crawl under the covers. I see you needing moments of quiet and a cup of tea. I see you reading books and writing stories of your own. I see you and I hear you when you say you are struggling. 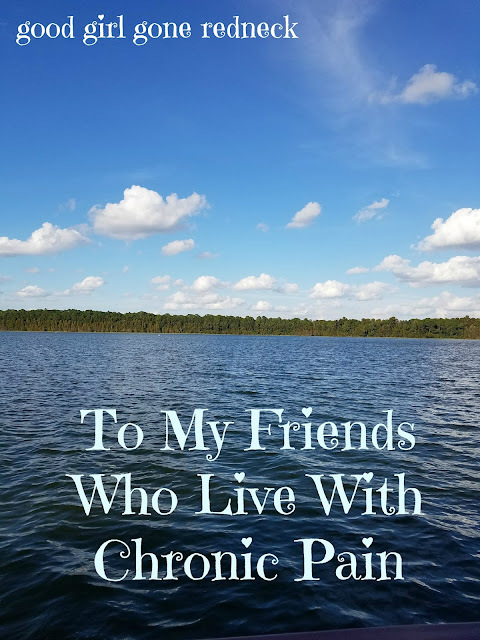 I remind you how much you accomplish each day in spite of the pain. I see you getting out of bed. Brushing your teeth. Your hair. Making breakfast. Eating. Struggling. Exhausted. Breathing through it all. I see you trying not to use up your spoons before noon. I wish I could give you some of mine. I don't always have a full bag - my anxiety can impact how well I juggle my own - but I have some to spare and they're yours if you need them. I cannot know what it is like to be you - but over recent months I have been working with more clients who live with chronic pain - and in doing so I have heard the stories and recognized you and your story in their words. So I wanted to be sure you know that I SEE YOU. And I'm here. Listening. Supporting. For whatever you might need. Take good care of you, my friends. Your illness may seem invisible to many, but you are not. You're not invisible. I see you. Thank you so much. My spoons are getting the better of me,today. I literally have tearsfrom reading this. You can't imagine what it means to me to hear someone trying to understand my struggle. Thank you from the bottom of my heart!